According to a previously unrevealed action in September, developer Forest City Ratner could benefit from $400 million in state-authorized tax-exempt bonds for much more than the planned arena. The recently-formed Brooklyn Arena Local Development Corporation (BALDC) is prepared to authorize up to $400 million in tax-exempt bonds for Atlantic Yards infrastructure, thus allowing FCR to save tens of millions of dollars and filling a funding gap discernible in project documents. --When, if ever, would such bonds be issued? --What revenues would back bond payments? --Could the state be on the hook to pay off the bonds? --Would the bonds be used to build the new railyard? --Would the full $400 million be issued? --Why wasn't this funding mentioned in the Modified General Project Plan issued in 2006 or its update in 2009? --How could bonds be paid off in the "delayed buildout" scenario envisioned in the Technical Memorandum (p. 55) issued in June by the Empire State Development Corporation (ESDC)? We know answers to some of the questions, but I'm waiting for the ESDC to provide additional answers (and will update this post when I get them). After the BALDC was formed, I reported on 1/26/09 that its scope contemplated financing for infrastructure improvements beyond the arena. (No dollar figure was attached, however.) That function had not been mentioned in other ESDC documents and has not been mentioned since. The infrastructure bonds, ESDC officials said at the time, would be paid back via a development fee to be paid by Forest City affiliate(s) leasing certain development parcels. If bondholders aren't paid, they could exercise leasehold rights, which would be subordinate to the ESDC's rights, so lien holders could develop the project only in accordance with the ESDC’s General Project Plan (which can be amended). Though ESDC officials said in January that the state would not have obligations to bondholders, last week, BALDC and ESDC officials, when asked (at about 2:25 of the video below) if the state could bail out arena bondholders, refused to definitively rule it out, saying "That's speculation" and "That's not foreseeable." The size of this important funding component--revealed in response to a Freedom of Information Law (FOIL) request--was not disclosed by the Empire State Development Corporation (ESDC) during the public comment period earlier this year regarding the revised Atlantic Yards plan nor before the ESDC approved the plan in September. There was no opportunity for the public to comment at the November 24 BALDC meeting authorizing arena bonds. "[W]e are issuing governmental bonds and there is no federal or state requirement for a hearing," ESDC spokeswoman Elizabeth Mitchell stated before the meeting. "The distinction is based on the fact that governments are already subject to a public process, in our case ESDC's prior hearings, for governmental projects." But the public process did not include any mention of tax-exempt financing for infrastructure. Thus, the public costs of such tax-exempt bonds were not available to those examining the project, such as the New York City Independent Budget Office. I submitted several questions to the ESDC early last Wednesday afternoon before the Thanksgiving holiday and then sent more on Friday morning. Though Friday was a business day, many people were out of the office and I was told a response might not come until today. The ESDC voted on September 17; the two BALDC documents--an Inducement Resolution and a document listing multiple resolutions adopted by written consent--were signed on September 11. I received them in response to a Freedom of Information Law request dated October 31. The documents were mailed on November 23, which ensured that I would not see them before the 10 am public meeting of the BALDC on November 24. State law requires agencies to grant or deny access to FOIL requests in five days or, if more time is needed, to respond within 20 additional business days. While the response to my request fell within the boundary, I suspect that the records sent to me could have been made available within just a few days. The BALDC last week authorized the issuance of some $800 million in bonds (mostly tax-exempt, with $150 million taxable) for the Atlantic Yards arena. After the meeting, BALDC President (and ESDC CFO) Frances Walton was asked (at about 3:26 in the video below), "Is there any provision to sell bonds in the future, either taxable rental bonds, kinda like, y'know, the Yankees did, in 2006, they did taxable rental bonds, and they did again, this year." "There's no expectation at this time that the LDC will be issuing any additional bonds for this project," Walton said. "Is it permitted, though, in the bond documents?" Bond Buyer reporter Ted Phillips followed up. ESDC attorney Jonathan Beyer, after turning and seemingly looking for a cue from colleagues, acknowledged "Yes." The exchange seemingly concerned additional bonds for the sports facility, but Beyer's response could have been an acknowledgment that the BALDC can also authorize bonds for infrastructure. Walton's statement, while seemingly referring to the "Atlantic Yards Redevelopment Project," may have been more ambiguous. It could have more narrowly meant the "Arena Project" and not the "Public Improvement Project," both subsets of the overall project, as stated in the 9/11/09 BALDC documents. 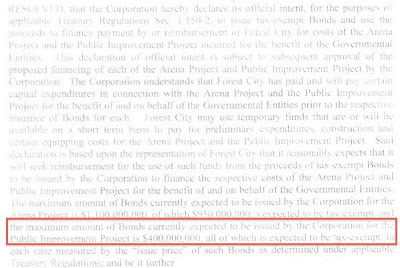 So even if there is no expectation of issuing additional bonds for the "Arena Project," that doesn't rule out issuing bonds for the "Public Improvement Project." But it has not been urgent for the BALDC to act on infrastructure bonds. Only the tax-exempt arena bonds face a 12/31/09 deadline. WHEREAS, Brooklyn Arena Local Development Corporation... was formed to finance certain components of the Atlantic Yards Redevelopment Project, including the design, development, construction and operation of an arena for use by a professional basketball team and for other sports and arena events (the "Arena Project") and, if deemed beneficial to the Atlantic Yards Redevelopment Project, to finance certain public infrastructure improvements related to such project (the "Public Improvement Project"). "Public Improvement Project" needed for eminent domain? The term "Public Improvement Project" is previously unmentioned in any Atlantic Yards documents, as far as I know. But it may be crucial to the exercise of eminent domain, because the state will not pursue condemnation until arena-related infrastructure is on track. (p. 9) The Arena Block will contain, in addition to the Arena itself, four buildings, a publicly accessible "urban room," and infrastructure to service the entire complex, including subway improvements and utility improvements. In January, I wrote that the 2006 Modified General Project Plan (MGPP) budgeted $544.4 million for project infrastructure, with $205 million coming from government funds but no particular source for the rest. The 2009 MGPP, passed in September, budgeted $717 million for project infrastructure, again with $205 million coming from government funds but no particular source for the rest. That gap apparently would be filled by the bonds. Would delay leave state on the hook? However, if current economic conditions persist beyond the timeframes of current projections, it is possible that future delays may occur. These potential delays due to prolonged adverse economic conditions would not affect the timing of the development of the arena, the transit access improvements, the construction of the new LIRR railyard, the reconstruction of the Carlton Avenue Bridge or the construction of Building 2. It could, however, delay the construction of some of the remaining buildings on the arena block as well as the Phase II sites. While the current construction plan calls for the continuous construction of the platform over the rail yard in Phase II, under this delayed build out condition, sections of the platform for Buildings 5 through 10 could be constructed as each of the buildings move forward in development. A significant amount of infrastructure is implied in the list above: the development of the arena, the transit access improvements, the construction of the new LIRR railyard, the reconstruction of the Carlton Avenue Bridge, and the construction of Building 2. Should tax-exempt bonds be used to fund the infrastructure, with the payments based on development fees paid for the lease of certain development parcels, a delay in development could lead to a delay in payments. The authorization is revealed in an Inducement Resolution the BALDC adopted on 9/11/09. RESOLVED, that the Corporation hereby declares its official intent... to issue tax-exempt Bonds and use the proceeds to finance payment by or reimbursement of Forest City for costs of the Arena Project and the Public Improvement Project incurred for the benefit of the Governmental Project and the Public Improvement Project incurred for the benefit of the Governmental Entities. This declaration of official intent is subject to subsequent approval of the proposed financing of each of the Arena Project and Public Improvement Project by the Corporation. The Corporation understands that Forest City has paid and will pay certain capital expenditures in connection with the Arena Project and the Public Improvement Project for the benefit of and on behalf of the Governmental Entities prior to the respective issuance of Bonds for each. Forest City may use temporary funds that are or will be available on a short term basis to pay for preliminary expenditures, construction and certain equipping costs for the Arena Project and the Public Improvement Project. Said declaration is based upon the representation of Forest City that it reasonably expects that it will seek reimbursement for the use of such funds from the proceeds of tax-exempt Bonds to be issued by the Corporation to finance the respective costs of the Arena Project and Public Improvement Project for the benefit of and on behalf of the Governmental Entities. 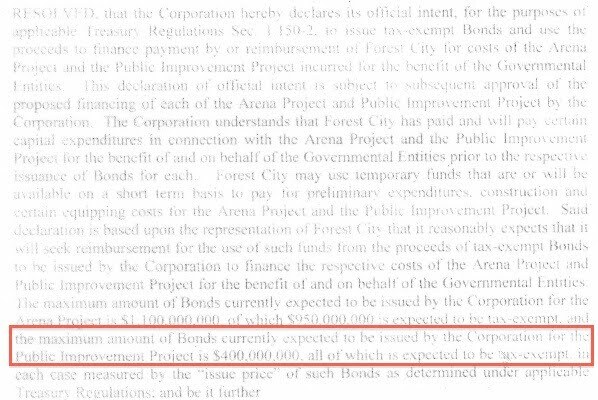 The maximum amount of Bonds currently expected to be issued by the Corporation for the Arena Project is $1,100,000,000, of which $950,000,000 is expected to be tax-exempt, and the maximum amount of Bonds currently expected to be issued by the Corporation for the Public Improvement Project is $400,000,000, all of which is expected to be tax-exempt, in each case measured by the "issue price" of such Bonds as determined under applicable Treasury Regulations.